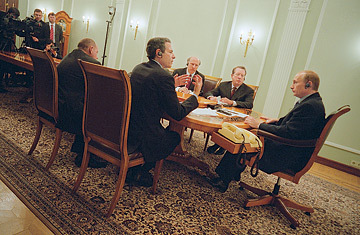 TIME managing editor Richard Stengel interviews Russian President Vladimir Putin. How do you see the relationship between Russia and the U.S., going forward? Russia and the U.S. were allies during the Second and the First World Wars, which allows us to think there's something objectively bringing us together in difficult times. Today to be successful, one must be able to reach agreements. The ability to compromise is not a diplomatic politeness but rather taking into account and respecting your partner's legitimate interests. The North Korean nuclear issue. We treated the issue very seriously. We were thinking about each other's interests and about the interests of the country in question. In the end we resolved the issue to a large extent. What should be done in Iraq? From the very beginning, I considered that it was a mistake. As for what we do today and in the near future, overall I agree with President Bush that everything must be done so that the Iraqi authorities are able to deal with security issues on their own. What we differ over is that the U.S. believes it is impossible to impose time frames for the withdrawal. In my view, that would prompt the Iraqi authorities to be more proactive. Why did Mr. Kasparov, when arrested, speak out in English rather than Russian? When a politician works the crowd of other nations rather than the Russian nation, it tells you something. Do you think the U.S. wants to see a strong Russia or a weak Russia? I believe the U.S. already understands that only a strong Russia will respond to the genuine interests of the U.S.
What is NATO's purpose today? If Russia were invited to join, would it do so? I wouldn't call NATO a putrid corpse of the Cold War, but it is a leftover of the past. How can NATO efficiently fight terrorism? Did it stop the terrorists on 9/11? Where was NATO then? Russia has no intention of joining military-political blocs because that would be tantamount to restricting its sovereignty. One of the perceptions that Americans have about Russia is that corruption is endemic. How do you handle that? Badly. I must say that in the transitional economy, it is difficult to address such problems. But I'm fully convinced that down the road, [they] will be tackled more efficiently. First and foremost, we should be governed by common sense. But common sense should be based on moral principles first. And it is not possible today to have morality separated from religious values. How does a lifelong KGB man raised in the Soviet Union become a believer in free markets? One doesn't have to be a particularly bright highbrow to see the obvious, that the market economy has major advantages over an administrative system. We have had GDP growth of about 7% a year on average over the past seven or eight years. We have paid off all our debt. Real income growth is about 12% for the population, and for me, that is the main achievement. You must feel lucky that the price of oil is so high. Fools are lucky. We work day and night! The government has arrested some �Russian industrialists and seized their assets. Why? Well, "Thou shalt not steal." They didn't have difficulties with me. They had difficulties with the people of the country and with the law. Has your KGB training helped you as President? There's an old saying "Once a spy, always a spy." Well, those are lies. Naturally, some of that background can be of help. They taught me to think independently. They taught me to gather objective information, first and foremost. The second thing, from working in intelligence, is learning the skill of working with people. Above all, to respect the people you're dealing with. In Russia, a number of journalists have been murdered. Is there some kind of pattern? Is there something that you or the government can do to prevent it? First, many people, including journalists, are tempted to make a little bit more money here and there, which means they get involved with entrepreneurs, sometimes with criminal businessmen. Then there are genuine fighters against corruption, against the criminal elements. Where such losses have occurred, I take them personally. What do you think are American misconceptions about Russia? Well, you know, I don't believe these are misconceptions. I think this is a purposeful attempt by some to create an image of Russia based on which one could influence our internal and foreign policies. This is the reason why everybody is made to believe, like, it's O.K. to pinch the Russians somewhat. They are a little bit savage still, or they just climbed down from the trees and probably need to have their hair brushed and their beards trimmed. Can you tell us more about Boris Yeltsin and Mikhail Gorbachev? They moved toward destruction of the system that no longer could sustain the Soviet people. I'm not sure I could have had the guts to do that myself. This is a very important change. It gave Russia her freedom. What about the conflicts you've had with former Soviet republics on gas prices? What conflicts? There are world prices for gas. Why should we sell to anyone below the world-market prices? Do Americans? Could you come to a store in the U.S. and ask, "Well, I'm from Canada. We Canadians are close neighbors. Give me that Chrysler at half price"? What would you hear from the salesman? "Go away!" President George W. Bush said he looked into your eyes and got a sense of your soul. Have you gotten a sense of his soul? I consider him a very reliable partner, a man of honor. Yes, Iraq was a mistake, but he is a fair and honest man. Do you think there was a missed opportunity after 9/11 for the U.S. and Russia to work more closely on the anti�terrorism front because of Iraq? We could have acted in a more coordinated and therefore more efficient way. That is true. But cooperation between our secret services is happening and is achieving results. Can you describe this cooperation? Are there institutional structures that exist between American and Russian intelligence in the field of fighting terrorism? Yes, the so-called partnership channels. And recently the work has been quite successful, including cooperation to prevent terrorist acts against the citizens of the Russian Federation and the U.S. I recently discussed this with President Bush over the telephone. Earlier you used the phrase Thou shalt not steal. Have you read the Bible? Yes, I have. And the Bible is on my plane. Do you use e-mail? Do you blog? Well, it's a big shame. I don't use these technologies. I don't even use a telephone. My staff do it for me. But they do it wonderfully.